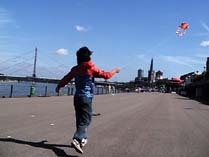 Yoshinori Niwa, Kite Flying with Local People, Düsseldorf, 2006. Documentation of performance. Courtesy of the artist. The Arts of Togetherness contemplated the capacity for contemporary art to shed new light on time-honored cultural practices. Through engaging interactive works, new media artist Sandee Moore and performance artist Yoshinori Niwa, transposed historical and modern, as well as traditional and popular, Japanese cultural activities into new contexts in order to explore notions of social exchange and community, memory and imagination, and the transformation of ideas over time. Using new and alternative methods and materials to reframe customary cultural activities, the artists aimed to underscore transcendent characteristics and reinvigorate assumptions about the meanings of such practices. Through the course of this exhibition, audiences were invited to consider how traditions facilitate interpersonal communication and construct harmonious accord. Featured Artists: Sandee Moore (Canada) and Yoshinori Niwa (Japan). Sandee Moore, Yutopia, 2009. Multi-media interactive installation with online interface (detail). Courtesy of the artist. This exhibition was generously supported by: The Japanese Canadian Cultural Centre, The Canada Council for the Arts, Ontario Arts Council, Manitoba Arts Council, Toronto Arts Council, FADO Performance Art Centre, Tani Miki, Goodwill, and the Japan-Canada Fund (a gift to the Canada Council for the Arts from the Government of Japan). Gendai Gallery was also pleased to collaborate with: Asian Arts Freedom School, the City of Toronto, Ikebata Nursery School, Kamp Kodomo, Manifesto, Kensington Market’s Pedestrian Sundays, Toronto Kite Fliers, and University of Toronto Art Centre.